Sidewalks make your home more valuable. But when they aren’t kept in good shape, they can become a hazard instead, putting you and your property at risk for lawsuits. To protect yourself, you need to keep up with basic sidewalk maintenance and repair. It’s not difficult, but it will take some diligence to do these basic methods of sidewalk repair. How can sidewalks get damaged? Sidewalks are made out of cement, which is cheap and easy to pour and provides a smooth, hard surface. The problem is that cement is also porous, which means it absorbs water. As water freezes, it expands. When it melts, the water contracts. This process of expansion and contraction, over and over again, eventually cracks the sidewalk. In some places where hard freezes are common, frost heave can rip up a sidewalk in just one winter season. Don’t park on sidewalks: Never park your car or any other type of heavy equipment on sidewalks. Cement is not meant to take this weight and will crack over time. Keep them swept: Leaves, ice, snow, and other trash and debris settle on the sidewalk. Degrading yard debris can compromise the integrity of the cement, while snow and ice melt and cause problems lower down. Watch for problem signs: Tree roots or leaking sewer lines can destroy a sidewalk, but if you keep an eye out for these issues you can catch them before they become a serious problem. Keep caustic materials away: Paint, cleaners, oils, and tar can destroy the cement of your sidewalk. Keep these materials off your cement and rinse the sidewalk immediately if there is a spill. How to do it: Your first step is to clean off the area around the crack. Brush out all the dirt and debris that might be in the crack and spray the area down thoroughly with water. If the cement is too dry around the crack, it will pull water away from the patching material. Quikrete concrete mix is easy to find at any hardware store. Prepare a bit according to the manufacturer’s directions on the bag, mixing it until it has the consistency of toothpaste. Apply it deep into the crack with the putty knife and then smooth the surface. Finishing up: Leave the crack alone for three hours. Then come back and spray the area down lightly with water and cover it with plastic. Keep the plastic on the crack for three days, spraying it down lightly once a day so it has time to cure. How to do it: Clean out the hole or crack, which might require a pressure washer to do thoroughly. Use the chisel and hammer to chip out concrete until you have created a V shape, with the wider part at the bottom of the crack. Clean it out again and thoroughly soak the area. Apply adhesive all around the crack with your paintbrush. This helps the patch material bond with the original cement. Apply the patch material following the same process as you would for smaller cracks. Finishing up: As with the smaller cracks, leave the area alone for a while. Then keep it wet and covered for about four days. 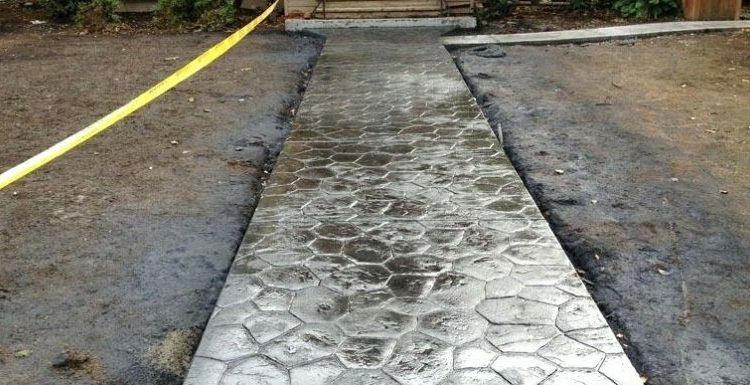 Once it has thoroughly cured, your sidewalk will be as good as new.